My keen interest in all natural skin care developed after growing up an 'all-natural girl' on a bee farm and then formally studying holistic nutrition. Believe it or not, having beautiful glowing skin is a sign of radiant health. While certain creams and product can be used to clean and moisten the skin on the 'outside,' what goes 'inside' is what creates truly healthy skin. It has been my experience that if you follow the steps below, you will be well on your way to having age defying, radiant skin. I follow these steps daily and when I don’t my skin tells me in the form of blemishes, break outs and redness. The good news is that it just takes a little planning and some small changes in habits to have glowing, radiant skin that resists aging. I get a lot of email from readers asking about natural skin care strategies and what they can use to achieve beautiful skin without all the chemicals and toxins found in most main stream products. There are natural solutions out there. If you follow the guidelines below everyday and develop more of an awareness of when your skin flares up, you will have a better understanding of your skin and what affects it. Many of our readers think that if they drink 'lots of water' out of the tap, they've got this covered. Wrong. You must drink at least 12 cups of filtered (I only recommend reverse osmosis), re-mineralized water daily, preferably away from food for optimal absorption. Tap water, while safe for cleaning and use in your toilet, is not ideal for cleansing the body internally. Despite endless claims that it is all you need as a water source, the fact remains that studies show hundreds of chemical residues remain in most tap water sources after treatment. If you are not filtering your tap water, you are the filter. Clean, filtered water is important for detoxification. Clean water flushes out the toxins that you are exposed to daily (and let's be honest - unless you live on an island in the middle of the ocean, you are exposed to toxins daily through the air and environment). Excess toxin build up in the body can lead to skin issues and does not support glowing skin. It is also important to remember that the skin is the largest organ and needs to be hydrated. Coffee, alcohol and caffeinated beverages dehydrate the skin so increase your water intake if you consume these beverages in excess. By the way, coffee, alcohol, chocolate and caffeine based drinks can sometimes trigger breakouts, so be on the lookout for that and possibly limit if necessary. If you can move your body for a minimum of 20 minutes a day (at an intensity high enough to break a mild sweat), you are well on your way to achieving a 'glow'. Your blood is your body's transporter of nutrients to your skin so the more you circulate your blood and lymphatic system, the better delivery of vitamins, minerals and anti-oxidants to your skin. These vital nutrients can then help slow aging, boost firmness and help repair skin cells. It is vitally important to sweat daily. Sweating everyday is a great way to detoxify. Your skin is your body's preferred detoxification system - break a sweat and then have a quick shower to wash away your internal debris! Exercise is a double edged sword - too much leads to faster aging and excessive free radical production. This is why many former professional athletes look very 'old' at a relatively young age. 30 minutes a day with brief periods of intensity is what is now proving to be healthiest. Your diet plays a huge role in achieving beautiful skin. If you can manage to eat small meals though the day balanced with protein, good fats (vegetable fats, non-hydrogenated) and low glycemic carbohydrates (whole grain, colorful, non-processed), you will supply your body what it needs to build and maintain beautiful skin. If your diet contains high levels of sugar and refined grains, you likely have high blood glucose levels and excessive insulin levels. This is linked to poor skin, breakouts and inflammation. Dark Berries - Blueberries, Raspberries and Blackberries are wonderful for healthy skin, loaded with skin boosting anti-oxidants. Limit fruit intake to 1 or 2 servings per day. Excessive fructose in the diet can lead to blood sugar issues which does not support glowing skin. Bee Pollen is loaded with anti-oxidants and minerals to support great skin. It is also a great snack to help balance blood sugar levels (which also aids in great skin). 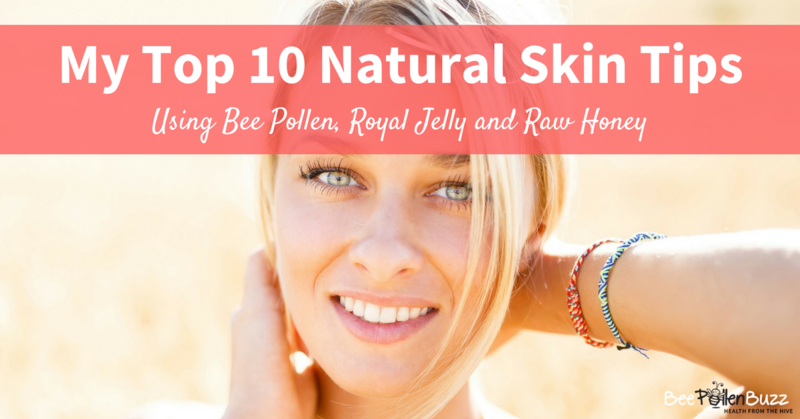 For more on using Bee Pollen for Skin health, read my article here. Whey Protein - protein is needed to build beautiful hair, skin and nails. I recommend and use ProteinSmart Whey Protein. This protein is highly absorbed, sustainably produced and free of growth hormones. Borage Oil - I highly recommend GLA Skin oil, which contains Gamma Linolenic Acid. GLA is vital for skin health as we age and is a major component of healthy skin. It helps to maintain the stability and fluidity of the natural water loss barrier in our skin, keeping skin cells moist and strong while improving the barrier function of the skin. Big, leafy green vegetables like spinach, kale, collards, broccoli and Swiss Chard. Collagen Plus - this is a precursor to collagen and is vital for keeping your skin firm and your hair and nails thick and strong. If you suffer from sagging skin, you need more collagen. Royal Jelly - Royal Jelly is an internal hydrator. After 21 days, royal jelly boosted the Skin Hydration Index of participants by 60% in one study. Omega 3 Fatty Acids - fish oil. Yes, this is highly beneficial for skin. It is highly anti-inflammatory and studies suggest it helps support clear skin. One teaspoon of liquid oil or three 1000 mg capsules per day should do it. Some foods to avoid if glowing, healthy skin is your goal. These foods and ingredients either increase the toxin load on your body or cause blood sugar fluctuations, neither of which support glowing skin. Chemical sweeteners like sucralose (sold under the name Splenda), Aspartame and Acesulfame potassium (sold under Acesulfame K or Ace K). Processed sugar. Look for sucrose, glucose, fructose, high fructose corn syrup on the label and avoid). Milk chocolate. It is loaded with sugar and dairy intake has been linked to acne. If you are going to eat chocolate, only eat 70% Dark Chocolate (or higher), which has been shown to be quite healthy for the skin. Common Allergens. Sometimes citrus fruits, wheat, dairy and soy can trigger common food sensitivities which can cause a flare up. I also recommend avoiding excessive peanut intake which is often contaminated with toxic mold. If you have low thyroid hormone and/or low estrogen, this can cause the skin to be thin and dull looking. If you are having trouble ovulating, it could be that your egg gets stuck because of an imbalance in hormones. This can cause a PMS breakout before your period. There are herbs and things you can take to address these issues. Royal Jelly - I recommend freeze dried royal jelly capsules. Take 1000 mg's three times per day for hormonal harmony. EstroSmart - a nutritional supplement that eliminates hormonal acne and helps to remove excess estrogen's from the body - both are good things for radiant skin. I highly recommend this product for ALL women and believe every girl the age of 13 should be taking it. Virtually all of us are overloaded with excess estrogen and this product helps remove these 'bad' estrogen's from the body which are linked to cancer and other hormonal issues. If you have dull skin, cold hands and feet, bags under your eyes that don’t go away no matter how much sleep you are getting, weight gain that won’t budge, wake up in a pile of sweat or feel lethargic most of the time, then it might be a good idea to get your thyroid checked out. Ask your doctor to test your THS and ask for your number. If the number is above 5, they may put you on medication, but if it is above 2 and under 5 (in Canada) they will tell you that you are fine. If this is the case (your number is between 2 and 5, and you suffer from the symptoms above) I recommend you read my protocol for low thyroid here. Essential fatty acids and other good fats in the diet are required to help with the absorption of skin healthy vitamins. Vitamins E, D and A all help the skin and are necessary for skin health. Don't avoid fats. In fact, you should embrace them (the right ones of course). Try to get at least two servings a day of the fat sources above. A key skin tip I use is to apply pure, organic coconut oil to my face twice a week. Not only do you smell delicious, but coconut oil works miracles for dry skin. Fish oil has been found to be effective in reducing photo-ageing, wrinkle formation and is also beneficial in preventing chronological ageing, such as thinning of the skin. Be sure to take a good multi-vitamin along with bee pollen everyday. This combination will feed your skin the vitamins, minerals and anti-oxidants what it needs to glow but also support overall health and longevity as well. You’ve likely heard of calcium. Calcium is mostly considered to be a mineral for bones, but there are many other functions it serves. When it comes to your skin, calcium plays a large role, primarily protective, in the overall health and strength of the skin. For example, for those with a high risk of developing skin cancer, The Journal of Clinical Oncology reports that supplementation of calcium along with Vitamin D reduced their risk. Furthermore, there are now studies correlating high calcium in the skin layers and lowering the absorption of skin damaging chemicals such as phalates. Reducing chemical absorption reduces the inflammatory effect the chemicals have on your skin. Inflammation = redness. Calcium has also been shown to lower the ph of the skin, creating a more ph balanced epidermis. If your pH level is too alkaline or too acidic, the mantle is disturbed and skin conditions such as dermatitis, eczema, and rosacea may result. In addition to calcium, it is important to obtain Vitamin D each day for glowing, radiant skin. A minimum of 15 minutes of sunlight exposure is recommended without sunscreen during the hours of 10am and 3pm (for optimal vitamin D conversion). You likely already know that you should never go to bed without cleaning your skin. If we don’t clean our skin, our pores can clog which leads to acne, blackheads and breakouts. If you wear makeup, it is especially important to clean the skin daily. There are thousands of cleansers on the market but simply applying raw, unpasteurized honey to your face and leaving it on for a few minutes before washing it off with warm water will have anti-bacterial and powerful cleansing and healing results. Honey is highly anti-bacterial and anti-septic. If using a raw food product such as raw honey is not for you, I recommend using this cleanser. Or use the Honey Scrub from Beauty and the Bee - both work very well. Follow up cleansing with a natural toner. Applying the GLA Skin Oil after cleansing works wonderfully. Just like cleaning the skin, hydrating the skin is also important. Most of the creams on the market contain numerous chemicals, preservatives and hormone disruptors. Avoid these. 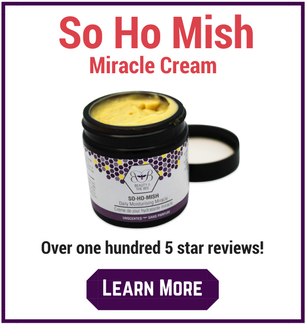 I use and recommend the So-Ho-Mish Miracle Cream as my day cream. 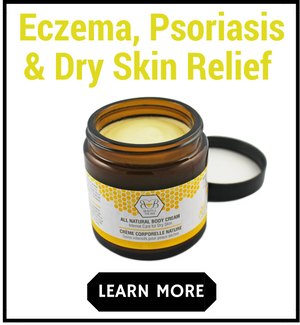 This cream is alive with raw, natural ingredients like royal jelly, raw honey and bee pollen. When I apply it to my face, my skin literally tingles. It is suitable as a night cream as well and does not contain any chemical preservatives, parabens, or fragrances. This cream has become our most popular product by far over the last few years because people simply love it. At night as a body cream or for stubborn skin issues like eczema or dry skin, I will use the Natural Body Cream with Beeswax from Beauty and the Bee. It is a thicker, heavier cream and it really helps problem areas or really dry patches because it contains healing beeswax. It also works great on a babies bum for diaper rash or for eczema for a baby. I have witnessed this cream treat the most stubborn cases of eczema and psoriasis, cases that doctors had no answer for but were eliminated in days by this cream. Poor functioning, slow moving or constipated bowels can cause a toxic buildup in the body. You can re-absorb toxins back into the blood stream which leads to dull, dry, irritated skin (among many other symptoms such as lethargy and headaches). You may also want to consider doing a cleanse and increasing fiber intake along with magnesium, vitamin c and lots of extra filtered water intake to improve your bowel function. I consume 1 - 2 tablespoons of organic, milled flax daily to increase fiber. Whole flax also contains skin healthy ALA and lignans. In Chinese medicine, skin complaints are often associated with a toxic liver and/or bowels, so sometimes doing a temporary “liver cleanse” and/or bowel cleanse is a fix for these issues. Drinking some lemon in water before bed is a great home remedy to cleanse the liver. Stress is a huge factor in how our skin looks. High cortisol (the stress hormone) has been linked to a number of health issues including poor skin. Laughter, breathing, sleeping and other stress reducing techniques will do wonders. When they talk about getting your “beauty rest” they really mean it! Sleep balances your nervous system and allows for healing to occur that you will not get during waking hours. You should get 7-8 hours every night for healthy skin. For additional stress support, I can not recommend the product AdrenaSmart enough. This product will boost energy, improve sleep quality and the ability to handle stress. If you follow the steps above, you will be well on your way to having great skin - naturally! It takes time and there is no quick fix, but if you can commit to having beautiful skin, abundant health will follow!